You couldn’t have posted this at a better time! Thanks! Wow! This is great job! Thank you! Good Post. Can you locate me the sources to learn TFS programming? I found very less documentation on this. 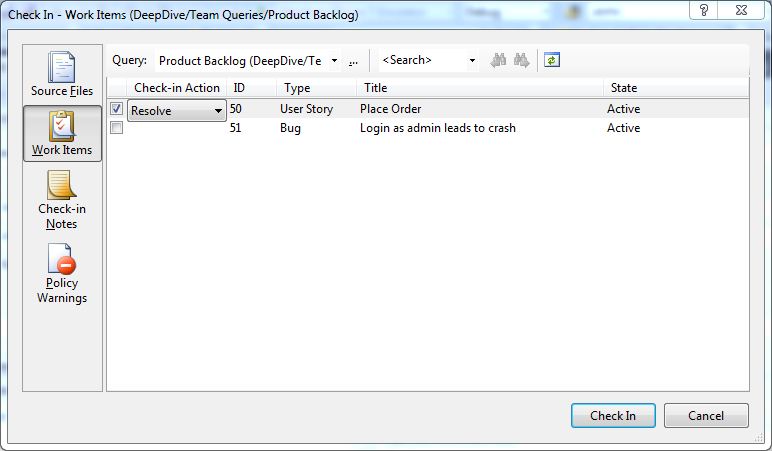 And, I have as old ASP.NET Issue tracker application to manage all bugs. 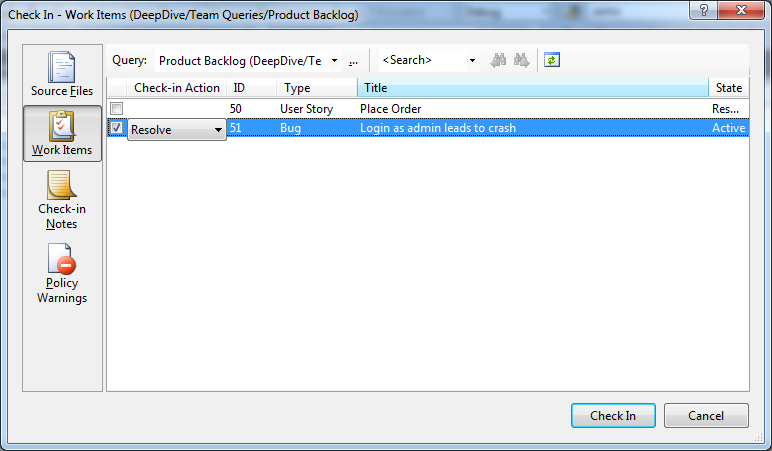 Now I would like to integrate my legacy application with TFS such a way that, TFS work items should be created automatically, whenever I create a bug in my ASP.NET issue tracker application. 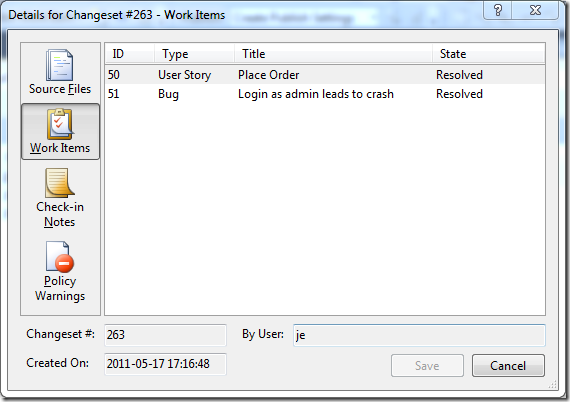 If status updated in TFS WI, the same should reflect in ASP.NET application. Can you suggest me the high level design for this integration? I am really looking forward to implementing this. The only question I have is currently we are still running TFS 2008, and although we have in plan to upgrade to TFS 2010 in the next few months, I want to implement this sooner. Will this work with TFS 2008? And if so, do I place the Inmeta.TFS.MergeWorkItemsEventHandler.dll in Microsoft Visual Studio 2008 Team Foundation ServerWeb ServicesVersionControlbin? I have a question. 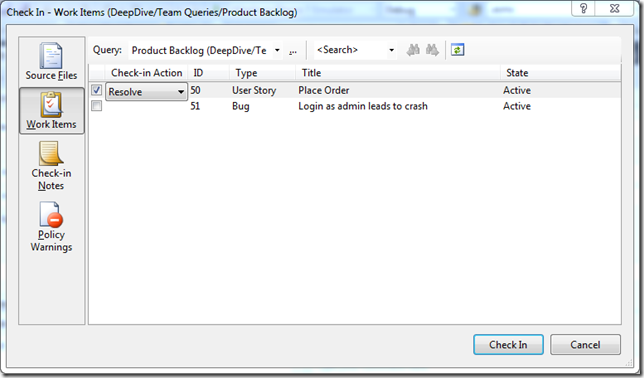 When I resolve a bug in a release branch and merge it into the main branch and later merge it again in the release branch is the work item always associated? 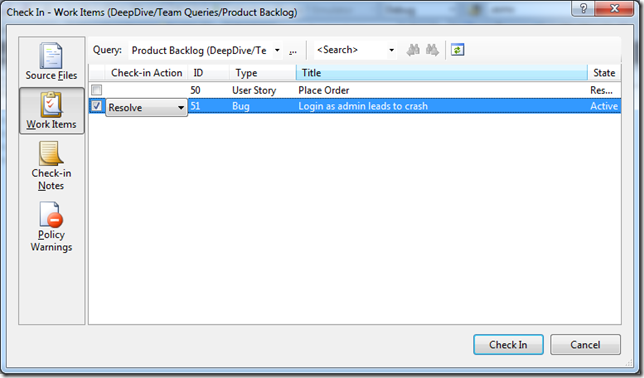 This brings duplicate when you merge the main branch back into the development branch. is there anyway we can eliminate it? Appreciate your code. It is simply great! I have a question though. I was debugging the source code of yours. I get the changeset number as -1 . Any idea about this? How is this reflected on Build reports? I thought a Work Item will only reflect one “Fixed in” build. How then if one Work Item is associated with multiple changesets in different release branchs do you account for what build this was fixed in? @John: If you associate several work items with a changeset, they will all appear in the “Associated Work Items” section of the build summary, and the build will update all work items with the Fixed in build information. And as you note, every new build will update the same work item with the new build number. If this is not what you want, you can take the route where you simple create a new work item for each branch. Is this addressed in TFS 2012? Any Idea.? @Carl: Thanks, glad that it helped! Is the version available on CodePlex from March this year compatible with both 2010 and 2012? @Town: Serverside plugins are bound to the version of the TFS server. I upgraded the Main branch to TFS 2012 in march, but the old version for TFS 2010 is still available in a separate branch called TFS2010. You can either get that branch and build it, or you can download the original 1.0.0.0 version that supports TFS 2010. This was the most important plugin in my TFS2010 installation – but now I have upgraded to TFS2013. Many thanks Jakob – you’re a hero! Brilliant! Many thanks Jakob – it’s really works! First of all, congratulations for the well done job. It worked perfect in our TFS 2013. But, in our environment, we have various Git repositories alongside TFVS repos, which of course the developers wanted to use your plugin with. Of course it didn’t worked, and digging around in MSDN I’ve noticed that Git repositories has its own classes in TFS API. 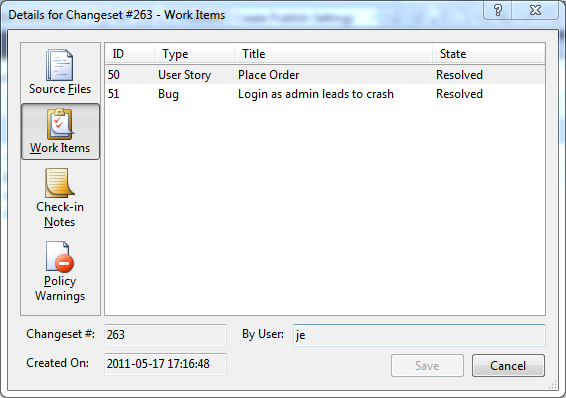 For example, instead check-ins there is pushes, and instead changesets there is commits. Thanks for your attention, and again, great work! Works fine also on our TFS 2013.. Really a great feature ! Notice: the username associated with the workitems on the target branch is the tfs build service account when there is a gated build defined on that branch… The actual check-in is indeed executed from the build server. Is there any trick to retrieve the name of the user who did the initial check-in ? We intend to use your plugin which seems to perfectly fit our needs. However before deploying it, i’d have a question. We use today in my company a branching policy for our bug fixes where the developers merge themselves their changesets from a “Fixes” branch to a “Servicing” branch” then from the “Servicing” branch to the “Main” branch and finally from the “Main” branch into the “Dev” branch. Thus as you’ve certainly guessed each time they have to re-associate the same WIs for each merge which is i have to confess very painful for them! That’s why your plugin may be the key for our problem. However to simplify their work, many developers merge several changesets (and the associated WIs) at the same time from the “Fixes” branch” to the “Servicing” branch and once it’s done, have only the resulting changeset to merge in the “Main” branch and finally into the “Dev” branch”. Here is my question. In the particular case described just above, will your plugin allow us to find all the required WIs into the final branch (ie the “Dev” branch). Thanks in advance for your answer 🙂 ! @Fred: Yes, the extension will look at the merge and then traverse all changesets (recursivelty) that was part of that merge and aggregate the associated work items for each changeset. What about Visual Studio Online? Do you suggest to use a service hook? 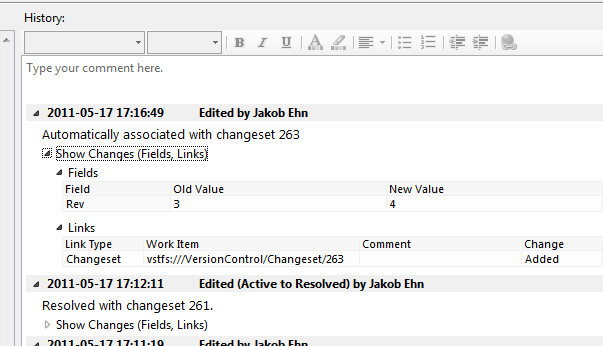 IMO the best solution is to have a tool where you could select multiple changesets and with one click merge them all separate merge changesets, so that each commit has the same description and workitem association as well. This is the ideal, otherwise it’s just a complication. 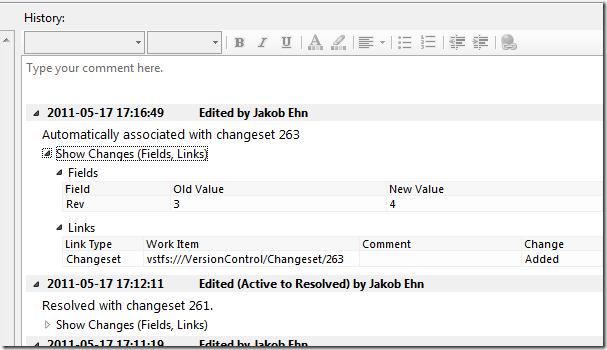 Immagine 100 changesets, merged and conflict resolved at once in one merge changeset. Even if this single merge changeset is associated to all the workitems of the original changsets, it’s still an ugly mess to track what was merged and if merged properly. So think about it. In case you are interested in developing such a client tool, please contact me. I’m interested in contributing. Thanks a lot for this solution. worked fine for me. do have also the tfs 2015 in your planning 😉 ?